Pentax Ricoh has announced two new entry-level DSLRs. The cameras both feature the same 16 million-pixel APS-C format sensor that made its debut on the Pentax K-30. In fact, the Pentax K-50 shares most of the same features as the Pentax K-30, but with an improved Prime M image processor and the ability to shoot at sensitivities up to ISO 51,200. 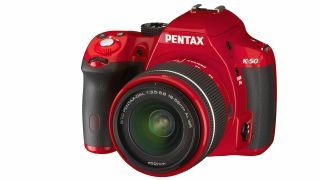 Although the two cameras are very similar, Pentax says that both the K-30 and K-50 will continue in the company's lineup, bringing the total number of DSLR cameras up to five. The Pentax K-500, also announced today, has very similar specifications but doesn't feature weatherproofing. Both cameras will come bundled with an 18-55mm kit lens, with the Pentax K-50's being weatherproofed. Other features of the cameras include a 100% field of view optical viewfinder, 1/6000 sec shutter speeds, customisable buttons and the capability to shoot in DNG raw format. Up to 120 different colour combinations will be available for the Pentax K-50, which can be ordered especially by customers. However, retailers will stock it in red, white and black, the lower priced Pentax K-500 is only available in black. Pentax is pitching the K-50 as a mid-range camera, despite its low price. The company hopes it will be tough competition for the likes of the Nikon D5200 and the Canon 60D. Available to buy from the end of the month, the Pentax K-50 price will be £529.99 (around US$830 / AU$870) body only, or £599.99 (around US$940 / AU$985) with the weatherproofed 18-55mm kit lens. Alternatively, the Pentax K-500 price will be £449.99 (around US$705 / AU$740) with the standard 18-55mm kit lens.